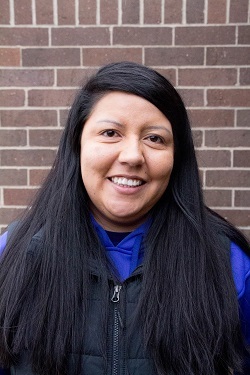 Judi was adopted at the age of 6 from Bogota, Colombia and grew up in the small town of Madelia, MN. She currently lives in Mankato MN. In her free time Judi enjoys spending time with family and friends and is an avid outdoors person. She enjoys camping and fishing with her family, going on hikes with her friends and going out on the lake during the summer. She also enjoys volunteering in her home town of Madelia by helping plan activities. Judi has always enjoyed helping people, and is currently working towards degrees in Sociology and Social Work. In the future she plans to continue working in the same field helping people with intellectual disabilities. Judi started working at the Harry Meyering Center in 2013 as a Direct Support Professional and currently holds the role of a Home Coordinator at Prairies Edge. What she enjoys most about her job are the relationships she’s made, and continues to make, with the individuals she serves. Whether it’s helping them with everyday needs or just hanging out with them in their home or out in the community, Judi always gets a sense of fulfillment when she leaves work.